Information Whether you like skiing in winter or hiking, exploring or mountain biking, or just taking in the fresh air and beauty of the surroundings, you have chosen the right place! In the heart of the marvelous Dolomites, for over eighty years our staff have been giving a warm welcome to those who share these passions, whatever the season. The ALPIN HAUS Smart &Family Hotel is in a marvelous position in the splendid valley of Alta Selva, ideally situated for the holiday of your dreams: an easy footpath takes you from the residence to the centre of Selva di Val Gardena, retracing the old railway line of the Gardena Valley and other communities down the valley, especially Santa Cristina e Ortisei. The bus stop for Bolzano and Bressanone is just 20 metres from the hotel. The SKIBUS stop in winter is 20 metres from the hotel. The FUNGEA ski-lift is just 150 metres from our Residence. 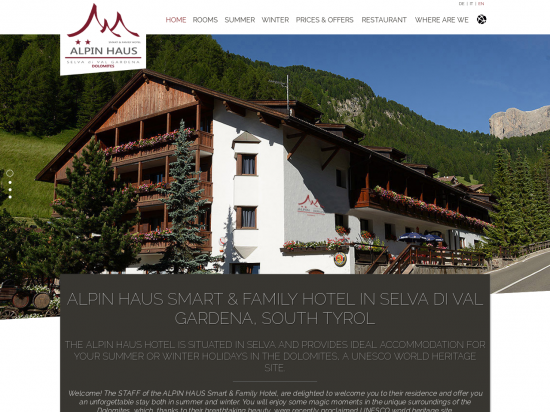 ALPIN HAUS Smart & Family Hotel – conveniently situated for easy travelling in the valley without using private transport.